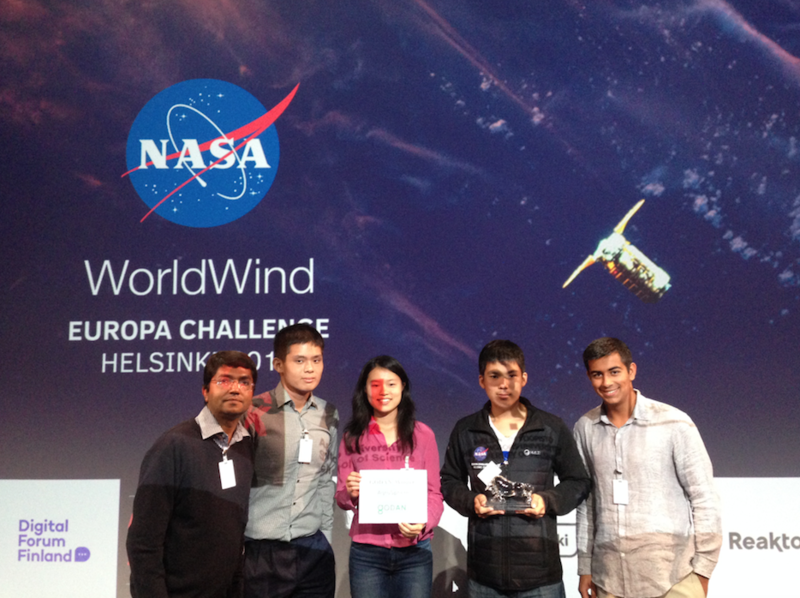 On behalf of the G7’s Global Open Data for Agriculture and Nutrition (GODAN), I want to thank all students and mentors who contributed for the NASA Worldwind Europa Challenge 2017. 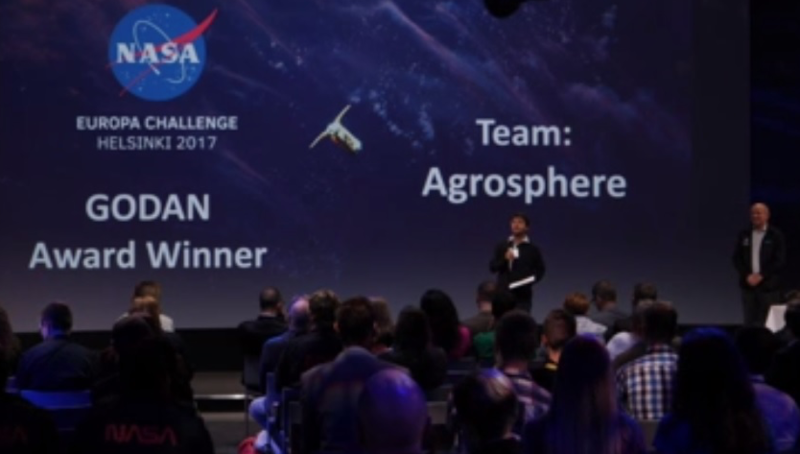 In January 2017, GODAN released a call for participants to take part in a Local Farming Challenge, with support from the NASA Europa Challenge. The call aimed to bring together researchers and students to find solutions for local farming in growing cities, using open agriculture and nutrition data. Agriculture must respond to an increasing urban population and changing climate conditions. Optimising local food production to wisely support our nutrition needs is an area where creative solutions are essential to our future. AgroSphere is an educational web application that visualizes the effects of climate change on agriculture using a large collection of global agriculture and climate data. Well done everyone and thank you for sharing your expertise for the benefit of all. 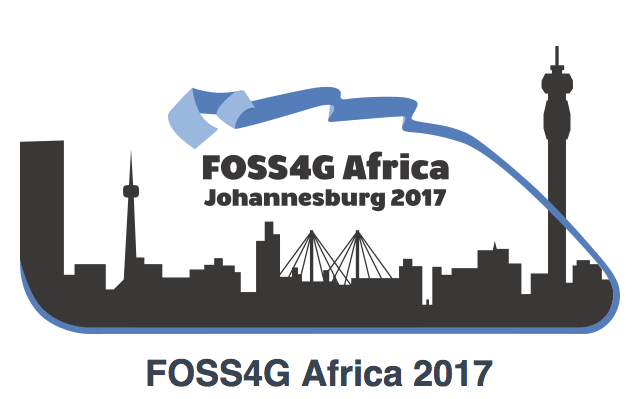 Greetings to all our colleagues who worked for the success of FOSS4G Africa 2017 in Johannesburg this week. It is also a great lead-up to FOSS4G 2018 in Dar es Salaam and to expand the wave of ‘Openness’ that is sweeping across the world and gains traction and momentum in every facet of society. Thanks to SAGTA (Southern African Geography Teachers’ Association) and it is great to see that they have teamed up with the world of secondary and tertiary education . Our thanks to every member of the GeoForAll Team who made this happen and the impacts that you all are now starting will be felt everywhere in the future. We recognize that data and innovation creates opportunities for people to influence their lives and future, reduce poverty, increase productivity, create jobs and participate in decision-making. 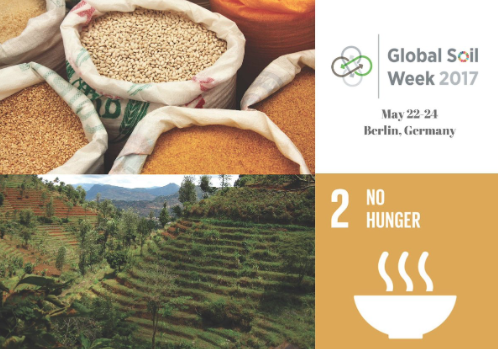 We underscore that sustainable agriculture can only be achieved with a broad alliance of people, particularly women and youth, governments, small holder farmers, civil society and the private sector, working together to secure a world that is food secure, without hunger and malnutrition. We therefore resolve to take urgent actions to achieve sustainable agriculture, reduce food insecurity and nutritional challenges by constituting an African Intergovernmental Network on Open Data for Agriculture and Nutrition, under the auspices of GODAN. We therefore decide to establish an Intergovernmental Coordination mechanism to support the network. The Intergovernmental Network on Open Data for Agriculture and Nutrition will hold an annual meeting. The next conference will be held in Uganda. 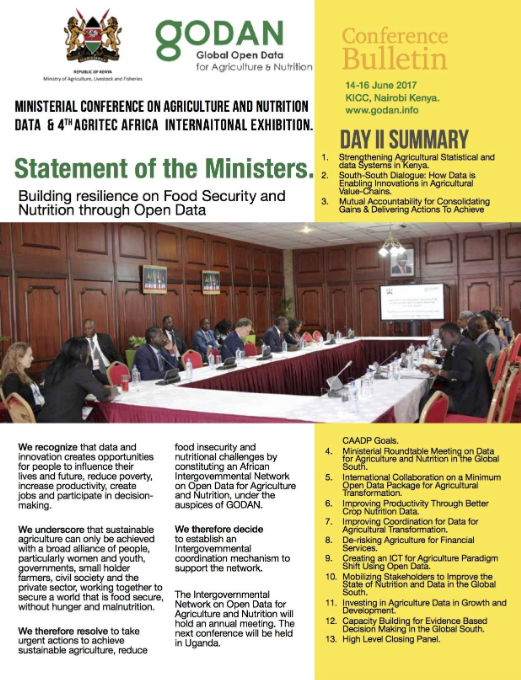 The GODAN conference held in Nairobi (14-16th June 2017) http://godanagritec.com is a result of a commitment made by Kenya’s Cabinet Secretary for Agriculture, Livestock and Fisheries, Mr. Willy Bett at the September 2016 Global Open Data on Agriculture and Nutrition (GODAN) Summit held at the margins of the UN General Assembly, in New York. 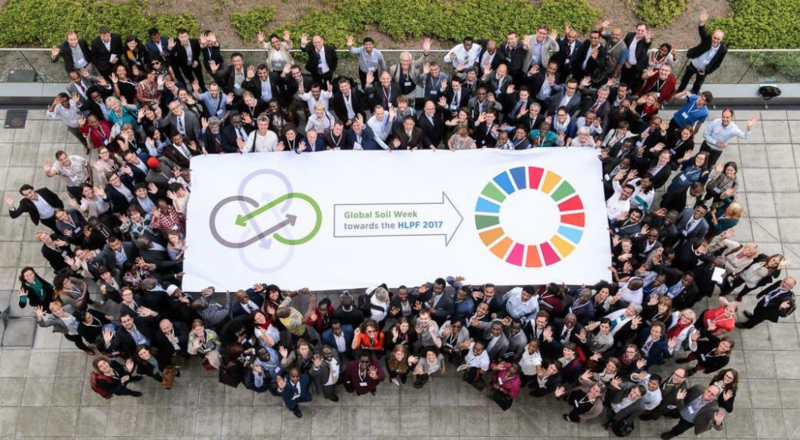 I want to thank the organisers and all participants for the very successful Global Soil Week 2017 in Berlin . The event brought together representatives from governments, and scientific and civil society organizations to assess some the gaps and synergies in Sustainable Development Goals implementation. 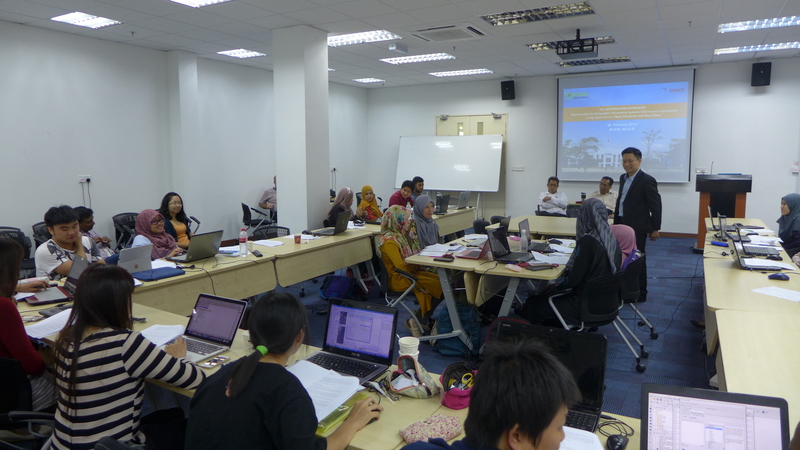 ISRIC, CIAT, GODAN and GIZ coorganised the Institutionalization of Open Data Workshop at the event . The aim of this workshop was to dentify gaps and challenges concerning the access to, the use of and the sharing of data; reflecting on strategies to make this data available and accessible to all: In order to improve the quality of agricultural extension services and to support decision-making concerning SLM implementation at the farm level, access to and availability of data (pedological, agro-ecological, socioeconomic) should be improved and ensured. In many cases, data are not available to agricultural service providers and/or are unavailable to the public. The underlying reasons for the unavailability of data can be manifold, ranging from unclear intellectual property rights to budgetary constraints which prevent making data usable and disseminating them. This working group will concentrate on the methods and mechanisms needed to render data available and accessible to all stakeholders, including local populations. 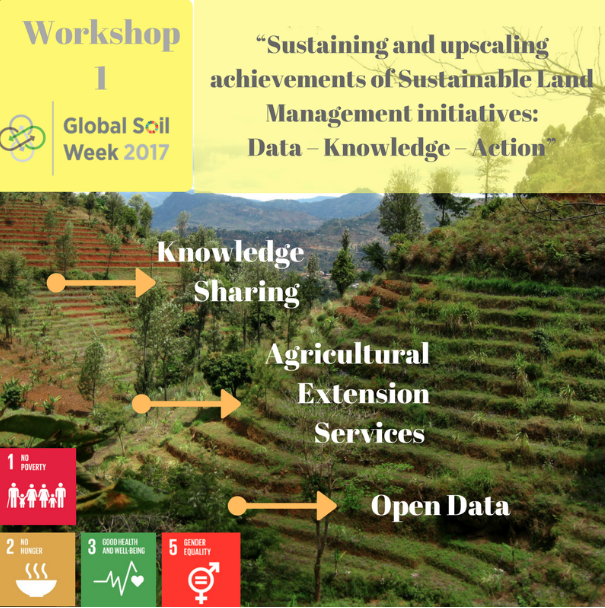 Thanks to Christina Ketter (GIZ) who coordinated the workshop , Ben Schaap (GODAN) , Leroy Mwanzia (CGIAR/CIAT) who did lot of background work for this successful workshop. Thanks to Andries Bosman (ISRIC),for presenting GODAN Soils Working Group and ISRIC , Daniel Jimenez (CGIAR/CIAT ) , country presentations from India, Ethiopia, Columbia and all participants for the productive workshop. It is good to see that the need for open data was acknowledged in the recommendations of GSW 2017 for the SDG HLPF. We look forward toworking with you for expanding research ideas for contributing to the successful implementation of the Sustainable Development Goals . The Geospatial IG  of the Research Data Alliance will be meeting in Barcelona on 5th April 2017 to keep building ideas for the global research agenda for Geospatial Data Science. I would also like to make use of the Geospatial IG meeting opportunity at RDA9 in Barcelona to further discuss ideas on the rise of OpenStreetMap (OSM) as a World Mapping Agency (WMA) build by the efforts of thousands of volunteers. It is also interesting to see the community links of the OpenStreetMap and the Open Source Geospatial Foundation (OSGeo) expanding rapidly both locally and globally. OSM has now reaching the level of a Global Mapping Agency build by the efforts of thousands of volunteers and OSGeo is the world’s largest geospatial ecosystem. What a great combination of synergies. Both initiatives are just over a decade old and have fundamentally changed the whole geolandscape. Myself and colleagues are working on a paper on OSM and OSGeo and i want to use this meeting to discuss more ideas with the community. I look forward to welcome you all to RDA meeting in Barcelona. Weather data is critical for agriculture. I thank our GeoForAll colleagues in The European Centre for Medium-Range Weather Forecasts (ECMWF) at Reading who are running the #OpenDataHack @ECMWF – Beyond weather: explore creative uses of open data ECMWF this weekend. I have good memories of my visit last year for the first hackathon on a Global Flood Awareness System (GloFAS)  they organised . It is my great pleasure to introduce our excellent colleague Dr Tuong-Thuy Vu as our GeoAmbassador. Dr Tuong-Thuy Vu is an Associate Professor of the School of Environmental and Geographical Sciences, University of Nottingham, Malaysia campus (UNMC). He is also the Asia chair of GeoForAll. A geospatial scientist by training and research, Dr Vu has over 15-years research and teaching experiences across Eurasia. 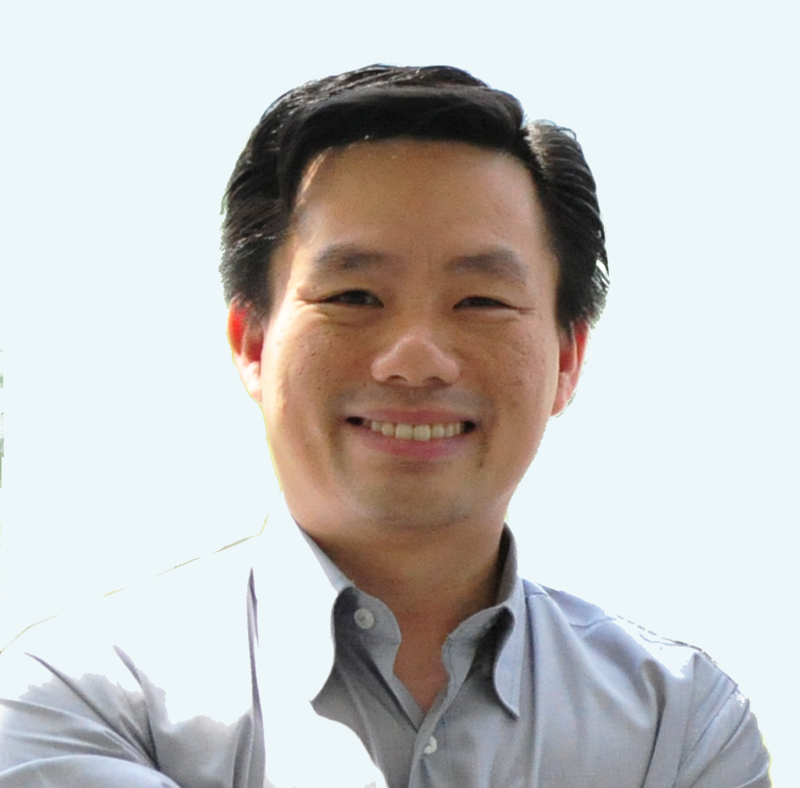 He obtained his Master and PhD from Asian Institute of Technology in 2000 and 2003, respectively, and started exploring open-source tools at the early stage. After his PhD, he worked as a research scientist at Earthquake Disaster Mitigation Research Center, Kobe, Japan (2003-2006) before joined Chiba University as a postdoctoral researcher in 2006-2007. In both places, he focused on the employment of geospatial technologies in disaster mitigation and management. He then joined GEO Grid team of National Institute of Advanced Industrial Science and Technology (AIST), Japan to further expand the research onto high-performance computing platform. In 2008, he went back to university to develop his academic career at Geoinformatics division, Royal Institute of Technology, Sweden. In early 2011, he took the position at University of Nottingham, Malaysia campus and assisted the establishment of the School of Geography and new MSc programmes at Malaysia campus. Late 2011, he established his OSGeo research lab (OSGeo.UNMC) , the first-of-its-kind in Southeast Asia and soon became among the first members of GeoForAll. OSGeo.UNMC aims at promoting open-source philosophy in education and research on geospatial science. The team developed the material to fully deploy OSGeo tools in teaching at postgraduate level, and introducing as an alternative tool for undergraduate students doing their final year project. In teaching and learning, OSGeo.UNMC team promote not only using open-source tools but also instructing a new way of open learning including open-mind, freedom, sharing and collaboration. There is a certain improvement of geospatial knowledge and skills for students when moving to open-source way, especially the confidence to try any available tools to address a specific issue. OSGeo.UNMC has been working very closely with Nottingham Geospatial Institute (NGI) team from the beginning. 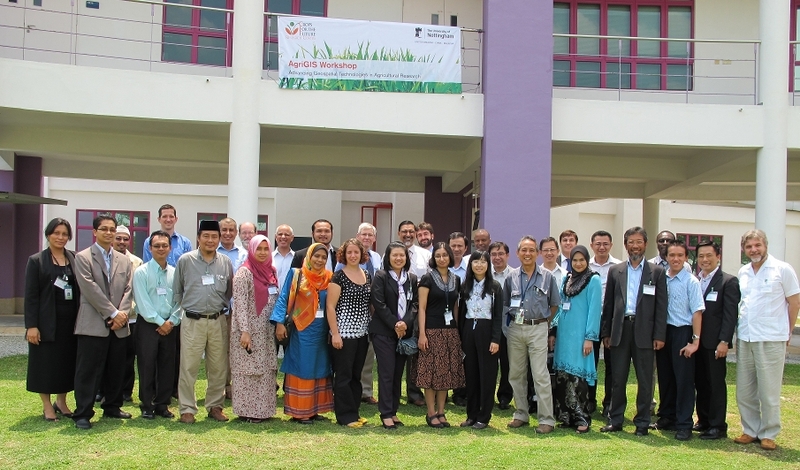 Together, we organised the AgriGIS 2012 (Figure 1), bringing together researchers and practitioners in agriculture and geospatial science. It was the very first public event to broadcast the name of OSGeo.UNMC to the region. 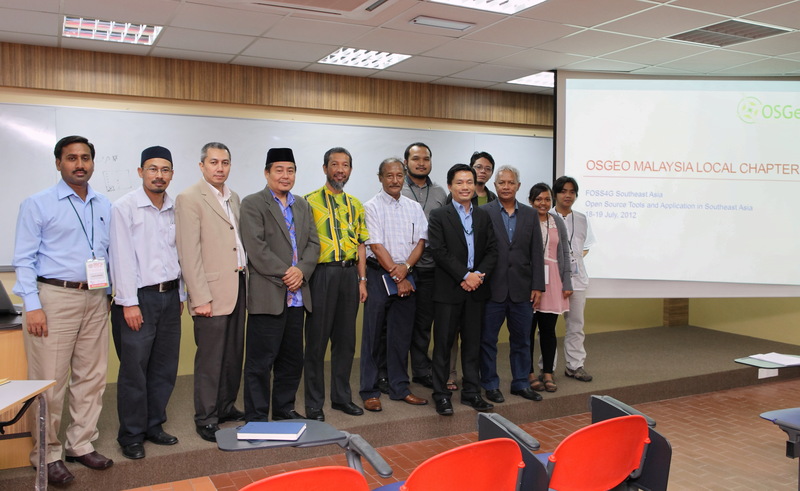 In addition to presenting at many public events, convention and conferences to introduce OSGeo and open geospatial science, Dr Vu coordinated the establishment of OSGeo Malaysia chapter (Figure 2). Thuy also leads the team organising a series of training to the public (Figure 3)  . In 2017, he is planning to assist the establishment of two new OSGeo labs in Vietnam universities. OSGeo.UNMC is developing its strong research activities on geobig data analytics. The team was awarded good national and international funding to work on remote sensing data fusion, change detection, remote sensing image analysis services, crowd-sourced data quality. In collaboration with its partners, OSGeo.UNMC promotes open geospatial science via collaborative research projects like urban construction management, urban green space, megafauna index mapping, and agricultural management. Geo for All is a worldwide movement that provides immediate benefit to the world. We aim to create openness in Geo Education for developing creative and open minds in students which is critical for building open innovation and contributes to building up Open Knowledge for the benefit of the whole society and for our future generations. We are proud to honour Thuy as our GeoAmbassodor and we are extremely grateful for his contributions to Geo for All. Thuy is a great ambassador for Open Geospatial Science globally. I am very grateful for getting this opportunity of introducing some of our amazing colleagues from different parts of our world each month as our GeoAmbassadors and get inspired by their amazing work and contributions for the wider community. The RCUK funded SMARt ciTIES is led by Professor Michele Clarke (University of Nottingham) and Dr. Ajith Kaliyath (National Institute of Urban Affairs, India) brings together a consortium of multidisciplinary, international researchers to develop new collaborative solutions to the multi-layered challenges of rapid urbanisation. The expertise needed involves education and social science, cultural heritage and urban planning, science and engineering, ecology and environmental sciences and information technology. 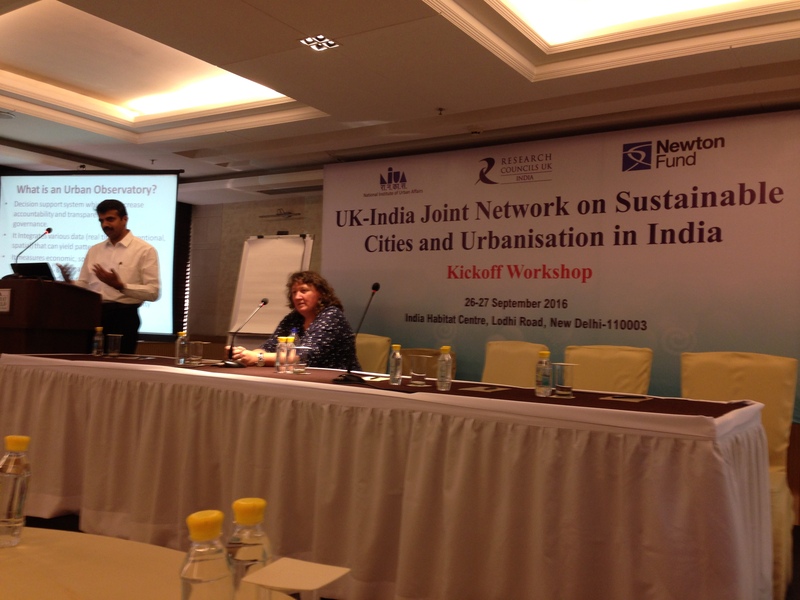 The network includes leading urban researchers from the UK and India, University of Nottingham, University of Birmingham, University of Southampton, Bishop Grosseteste University College, Loughborough University, Northumbria University, Nottingham Trent University and University of Surrey, Jawaharlal Nehru University, IIT Delhi, IIT Kharagpur, IIT Roorkee, Indian Institute of Population Studies Mumbai, Indira Gandhi Institute of Development Research Mumbai and Institute for Social and Economic Change, Bengaluru. 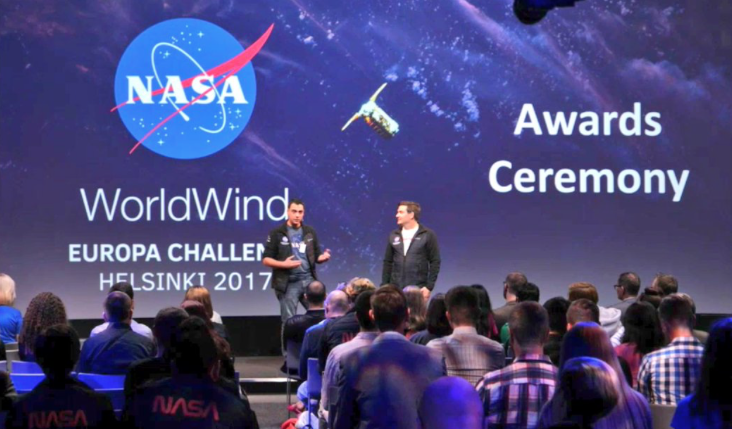 The NASA Europa Challenge is there to inspire innovative ideas for building applications that serve the INSPIRE Directive and use the ESA-NASA open source virtual globe technology, Web World Wind. SMARt ciTIES is pleased to participate in this fifth year of the NASA Europa Challenge, specifically involving UK and India students. You are challenged to build a great application that serves some aspect of the OpenCitySmart design and uses NASA’s open source virtual globe technology, Web World Wind. 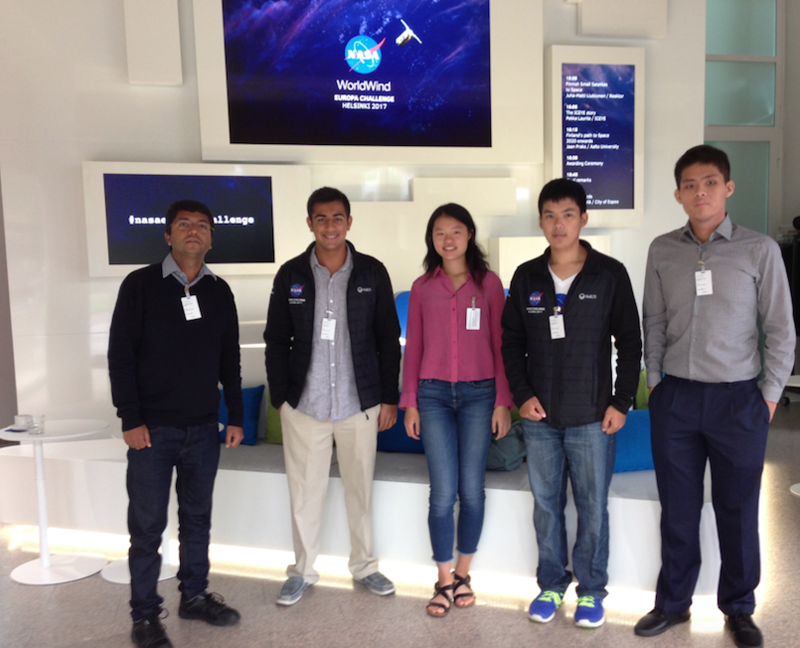 SMARTIES has been promoting NASA Europa Challenge through our workshops in India , . We are pleased to announce the launch the SMARTIES Entrepreneurship competition through the NASA Europa Challenge 2017. SMARTIES will provide 5000 GBP for awards (£2500 for First Place, £1500 for the Second Place and £1000 for the Third Place). Due to the nature of the funding, the SMARTIES Entrepreneurship awards are specific to all UK and India students who participate in the NASA Europa Challenge 2017. This is a contest where everyone wins just by playing! Help your city and thereby the cities of the world with capabilities all cities need. We are in this world together, let’s deliver results ‘for the benefit of all’, the NASA motto. The EUROGEO 2017 Conference is organised in Amsterdam, The Netherlands on 2-3 March 2017. Geographical education is facing many challenges at schools and in higher education. The purpose of EUROGEO 2017 is to examine some of these issues and their possible responses. How does geographical education respond to needs of society and the world around us? Does geographical education give young people the necessary tools they need to think spatially? How do new technologies and open access to data help engage youngsters? How should education respond to the ever-increasing importance of geographic information? Happy to share this excellent updates from our GeoForAll colleagues in Tanzania. 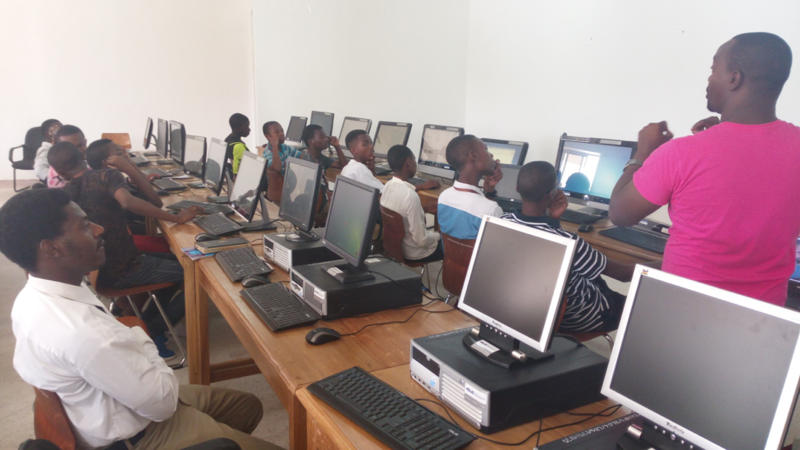 Over the first week of January 2017, a group of 60 secondary school students gathered at Marian University College, Bagamoyo for a ground-breaking training session – the Science Technology Engineering and Mathematics (STEM) Youth Boot Camp organised by Projekt Inspire in collaboration with the Ramani Huria team. 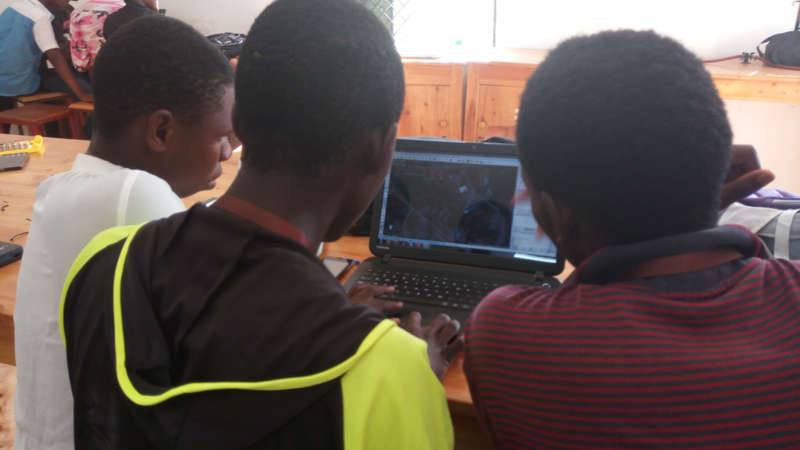 These students, hailing from different regions of Tanzania (Dar es Salaam, Moshi, Arusha, Mbeya, to name a few), were there to be introduced to GIS and web mapping using open source technologies and open data .